Stir fry is one of my favorite things to make for dinner for a number of reasons. I love being able to get dinner on the table in a relatively short amount of time. I like using whatever I have in the fridge for the vegetables. I love using broccoli slaw for the vegetable when I don’t have anything “bigger” on hand. I’ve learned to make a fairly consistent sauce with wine that my whole family enjoys. Tonight’s dinner was no exception. I started with chicken tenders, slicing them into bite-sized chunks and saute’ing them in a pan sprayed with Pam until browned. I then removed them from the pan, added a little bit of olive oil, and popped in the vegetables. Tonight’s assortment included broccoli slaw and fresh green beans. Once these were cooked to crisp-tender, I added my sauce. The sauce for dinner tonight was a standard for me, albeit unique from most conventional stir-fry sauces. REMEMBER: I USE THE FORCE WHEN I COOK! Using a 1-cup Pyrex measuring cup, I poured in about 1/4″ of hoisin sauce, a small amount of oyster sauce (seriously using The Force on this sauce), a large amount of an oaked Chardonnay (maybe 3/4-cup? ), an inch of pre-crushed garlic from a tube, an inch of lemongrass (again, from a tube), a spoonful of flour and a smaller spoonful of homemade pesto. I had mixed this together earlier so the flour wasn’t glumpy and stirred it occasionally until it was time to add to the saute’ pan. Once I added the sauce to the veggies in the pan, I dropped the chicken back into the pan and popped a package of Uncle Ben’s Microwave Brown Rice into the microwave. 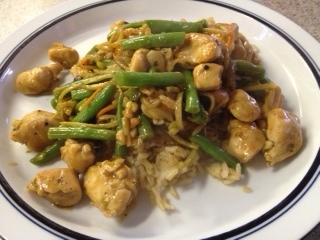 90 seconds later, the sauce was thickened and the brown rice was done… dinner was served! There are tons of ways to make this recipe your own, but this is one of my favorites. I’ve substituted shrimp, pork, or beef for the chicken. I’ve used Vidal Blanc, Chardonel, or even a Sauvignon Blanc if that’s what I had on hand. I absolutely love the tubes of garlic, ginger, lemongrass, basil, or Italian herbs that I can find at my local market, so usually add a variety of flavors from those handy items. There’s enough salt in the ingredients already that I typically won’t add more, but I have been known to add paprika or some lemon thyme if I want a different taste to come through. It all depends on my mood as I’m cooking. Dinner in a flash… it can certainly be done, but it does take some thought and a little planning. I’m just grateful that my family enjoys most of my experiments. It’s not a 15 minute dinner, but it doesn’t take that much longer to go from fridge to table. Try this with your family and see where The Force might lead… a totally unique dinner might be just around the corner!